Six weeks after the Coupe’s launch, Dr. Ing. h.c. F. Porsche AG introduces the new 911 Cabriolet. 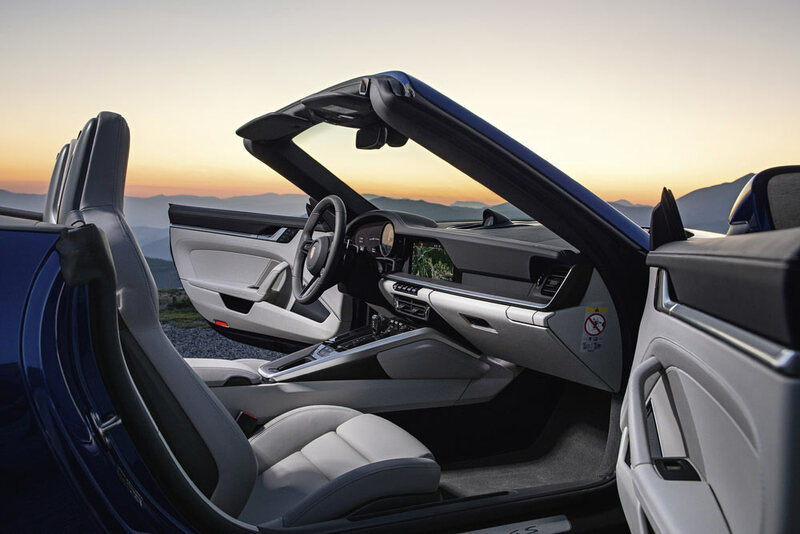 The open-top 911 continues a long tradition, established when Porsche unveiled the prototype of the first 911 Cabriolet in September 1981 at the International Motor Show (IAA) in Frankfurt. A year later, the first 911 convertible rolled off the production line. Initially available as the 911 Carrera S Cabriolet*, the latest soft-top version of the brand’s iconic sports car includes all the innovative features of the Coupe, along with convertible-specific elements, such as new hydraulics responsible for opening and closing the roof quicker than ever before. 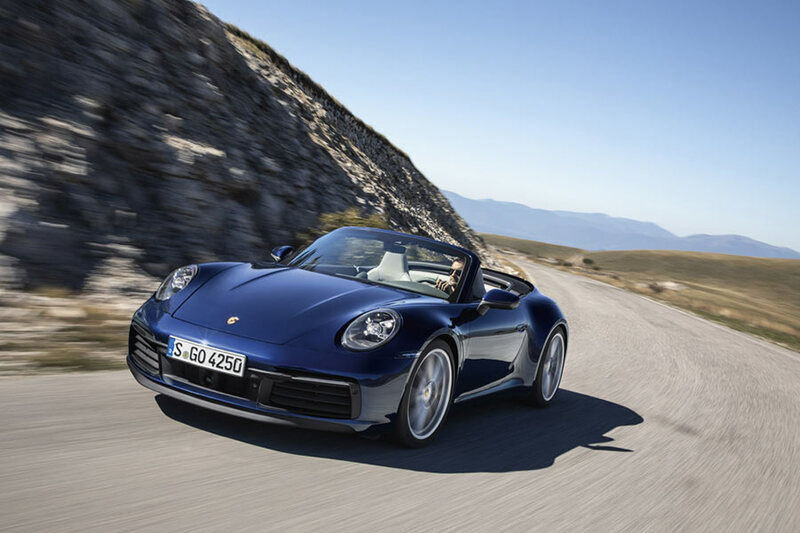 The open-top version of the iconic sports car echoes the modern lines of the Coupe, though it remains unmistakably a Porsche 911 in Cabriolet form. The fully automatic soft top has an integrated glass rear window. Its structure contains magnesium surface elements known as bows, which reliably prevent ballooning of the roof at high speeds. The roof can be opened or closed at speeds up to 50 km/h. New hydraulics reduce the opening time to around twelve seconds, while an electrically extendable wind deflector ensures that necks are shielded from wind impact. 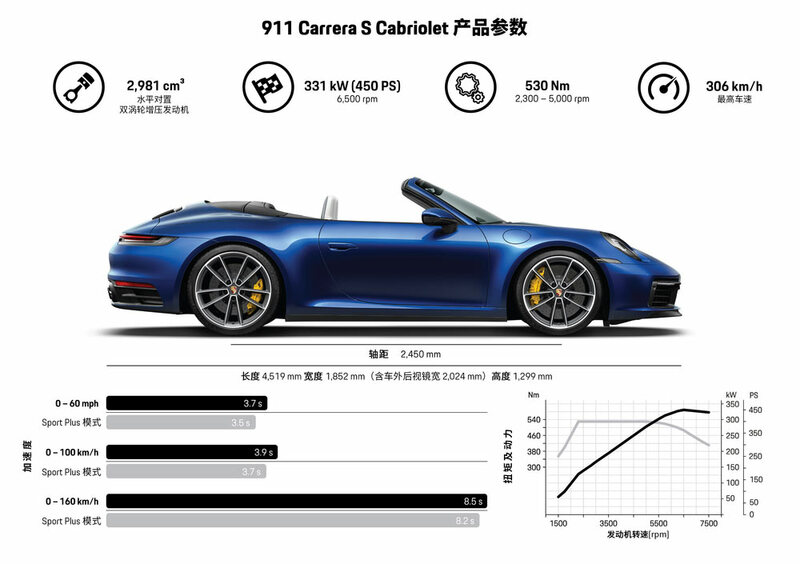 The new 911 Carrera S Cabriolet with rear-wheel drive relies on a 2,981 cm³ charged six-cylinder boxer engine with 450 hp (331 kW) at 6,500 rpm and 530 Nm torque between 2,300 and 5,000 rpm. Thanks to an improved injection process, drive efficiency has been increased whilst emissions were reduced. Other optimisation measures include a new layout for the turbochargers and charge air cooling system. The power is delivered by a newly developed eight-speed dual-clutch transmission. 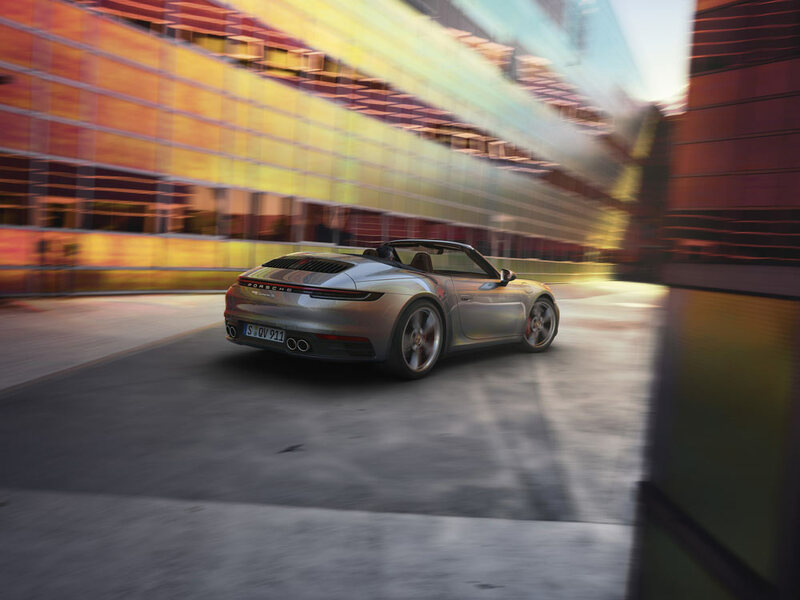 The 911 Carrera S Cabriolet accelerates from zero to 100 km/h in 3.9 seconds (with optional Sport Chrono Package: 3.7 seconds) and can reach speeds up to 306 km/h. The new engine mounting position makes the convertible more torsionally rigid than its predecessor. For the first time, Porsche Active Suspension Management (PASM) sport chassis is available for the 911 Cabriolet. It features harder and shorter springs, more rigid front and rear anti-roll-bars as well as a 10-millimetres lower chassis. These adjustments give the 911 convertible a more neutral feel on the road, with better weight distribution. The new 911 Cabriolet looks wider, more self-assured and altogether more muscular than its predecessor. Wider wings arch over the large 20-inch wheels at the front and 21-inch wheels at the rear. The rear-wheel-drive models now match the bodywork width of the existing all-wheel models. The rear axle has grown by 44 millimetres, whilst the 45-millimetres wider front end revives a traditional feature from earlier 911 generations: a forward-extended bonnet with a distinctive recess in front of the windscreen. Both elements lengthen the front of the vehicle and give it a dynamic look. The rear is dominated by the significantly wider, retractable spoiler and the continuous, seamless light bar. With the exception of the front and rear sections, the entire outer skin is now made from aluminium. The interior is distinctive, with clear, straight lines and recessed instruments defining the dashboard. As it does in the original 911, the new dashboard covers the entire width between two horizontal wing levels. Alongside the centrally positioned rev counter, two thin, frameless freeform displays deliver information to the driver. Now 10.9 inches in size, the centre screen of the Porsche Communication Management (PCM) can be operated quickly without causing distraction. As a world first, Porsche has developed the Wet Mode, which is included as standard. This function detects water on the road, preconditions the control systems accordingly and warns the driver, who can then opt to set up the car with a focus on safety, by simply pushing a button or using the mode switch on the steering wheel (Sport Chrono Package). The camera-based warning and brake assist system, also fitted as standard, detects the risk of collision with vehicles, pedestrians, or cyclists, and initiates a warning or emergency braking procedure if necessary. A Park Assistant system, including reversing camera, completes the standard configuration of the convertible. Options for the 911 include Night Vision Assist, with thermal imaging camera, as well as adaptive cruise control with automatic distance control, stop-and-go function and reversible occupant protection.